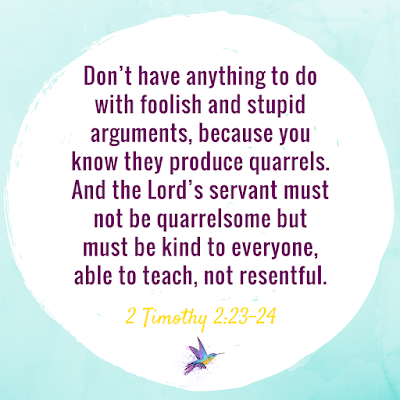 Have you ever been talking to a friend or family member and everything is hunky-dory, but all of a sudden the two of you are in the middle of a debate or disagreement that you never saw coming? Maybe you learned something about your friend that shocked you, or maybe you said something that a family member was surprised by and whole-heartedly disagreed with. Either way, in that moment, things can escalate quickly if we aren't careful. 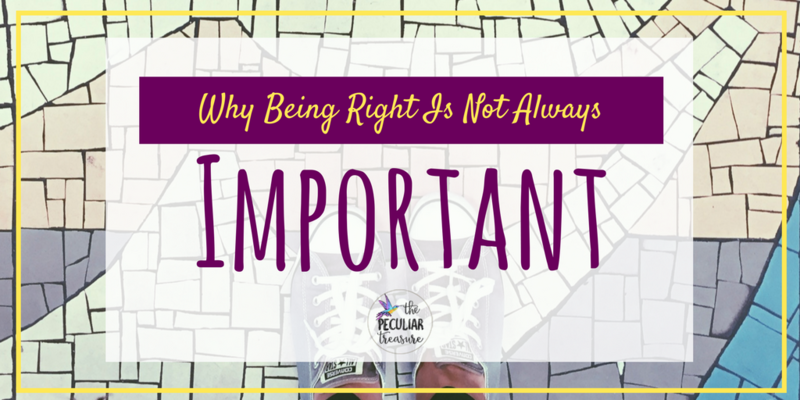 It's our human nature to want to be right (and to have others know that we are right). We feel validated and important when we are right. And if the subject is important enough and we really are right, then we also can feel an urgency to show our loved one the way. And sometimes, our greatest desire is for them to see the way. It can also be easy to get caught up in the little things. Things that really don't matter or have any huge barring on life, and yet we still feel the need to prove that we are correct. But always feeling the need to be right, argue, or debate is not something we should allow in our lives. 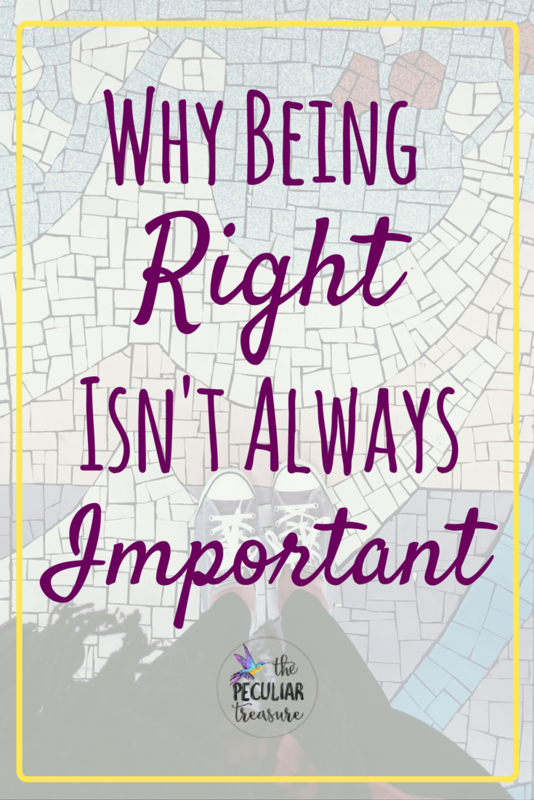 The need to be right all the time can lead to a lot of issue that could have been avoided otherwise, and at the end of the day, being right isn't always that important. Always feeling the need to be right will quickly push people away. Even if we aren't trying to be jerks about it, and even if we are just trying to "help" by "showing them the right way", people grow weary of debate very quickly. In addition to this, we all hate being wrong. We hate the idea that someone else is right about us and that we may need to change our ways of thinking, or maybe even our actions. So when we are threatened by that idea, it's easy for us to push the other person away than to admit that we are in the wrong. So even if we are 100% right about whatever we are discussing, we have to measure whether or not it is really that important. Is it worth possibly pushing someone away? Often, we will find that it's not. 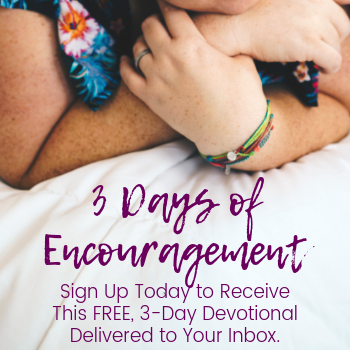 Sometimes when we are caught up in the heat of the moment, we forget that people with differing opinions aren't the enemy. We forget that someone thinking differently than us is not a threat. Differences don't necessarily mean anything bad- they are just different. That's why we have to use wisdom as we approach people who think differently than us. We have to decide if 1.) it's even worth addressing, and 2.) how much we really need to get into it if we do address it. Sometimes we should talk about our differences, and it's not always bad to discuss it. But if we do, we have to have the wisdom to know when it's time to drop it and the grace to treat people well no matter how different they are from us. We also have to have the wisdom to realize that we are not always right. Just because we feel right doesn't mean we are. And even when we are right, grace and wisdom go a lot farther than shouting our "win" to the rooftops. When we start feeling the need to defend every little position and to be right all the time, pride will start to grow in our hearts. We will slowly stop listening to people without even realizing it. We will become the person who is just waiting with baited breath for the other person to stop talking so that we can start explaining why they are wrong. As Christians, there are certain extremely important truths that we do want to make people aware of. There are things that are of the utmost importance that are worth trying to convince people of (gently and appropriately). But when we become ready to debate anything and everything at the drop of a hat, we will lose our credibility with people. They will see us as argumentative, stubborn, and set in our ways. At that point, we have lost the ability and privilege to talk to them about the things that matter most, because they've probably already grown tired of us always trying to prove our side on the more trivial issues. Even if what we've been trying to convince them of isn't trivial and does have some value, if we've worn it out and they are tired of talking to us about semi-deep things, then we have still hindered our impact when it comes to the things that matter most. And this is the biggest reason trying to be right isn't always so important. We must prioritize always. We must use wisdom, kindness, and consideration when we talk to people about things that are important to us. If we don't, we will forever be tuned out, and will have no one to blame but ourselves. Friends, don't hear me saying that we can't talk about important issues. There's something to be said for rational and calm dialog. We can have conversations, disagree, and come out on the other side of it just fine- if we do it right. But use wisdom. Practice wisdom. 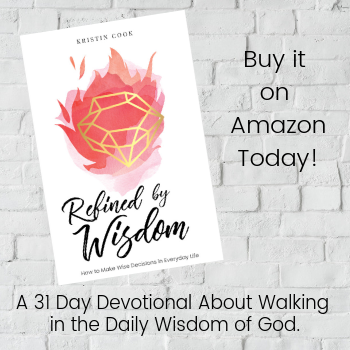 Pray for wisdom. Let God guide us in the best ways to discuss the little things, the big things, and everything in between. 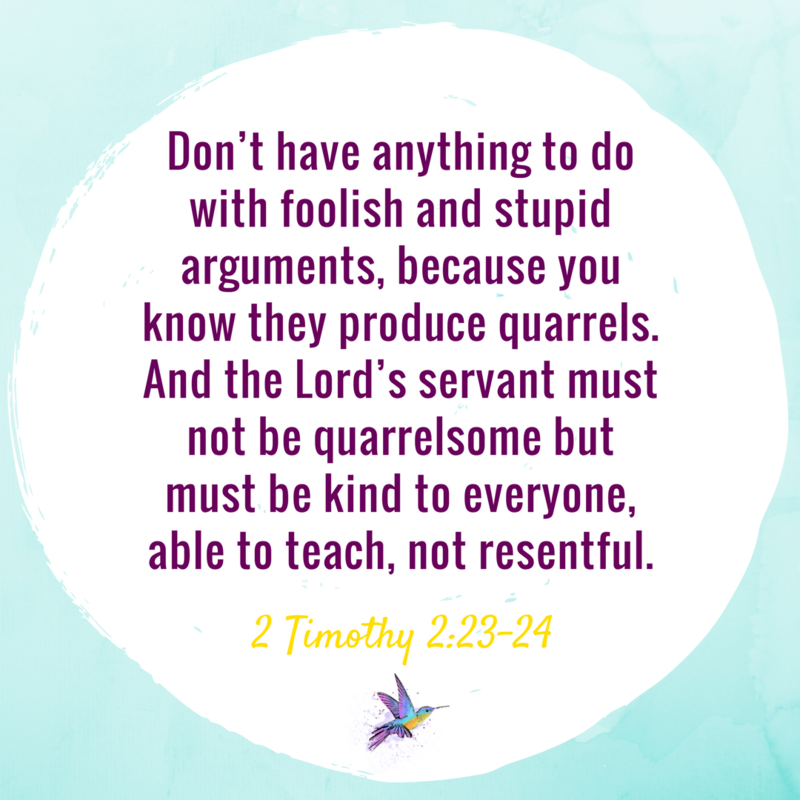 Are you usually the one leading a debate or shying away from all confrontation? Comment below. Well said. We so often forget the power of our words. Ouch! 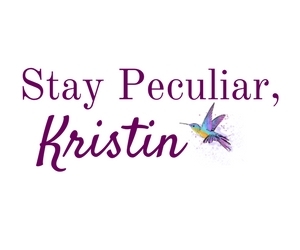 Stepping on my toes Kristin! And you know I'm the worst when it comes to my husband....ouch again! I've always tended towards rules and black and white and so it's easy for me to hang onto my point of view and be willing to debate and defend it. Interesting thing is that it's my husband who is a lawyer! Thanks for sharing this! What Marsha said! It reminds me that grace and humility are so so so important when it comes to maintaining relationships! This is an excellent post! I have learned this and continue to learn this over and over the longer I'm married and the older I get - it's important to pick your battles and know when to just show some humility and grace. Love this! I think this is a life long lesson. I think for me it also ties into being heard. Being heard and being right go hand in hand for me, and I need to just practice staying calm and not seeing eye to eye with everyone. I think this is super smart! Always insisting on being right can definitely damage your relationships, even if that's not your goal. Whenever I'm wrong, it's great practice to keep me humble! I seriously love this post! It's so hard for me to have conversations with people who always have to be right and it really does get in the way of the conversation as a whole. We can learn so much from difference of opinions!! Honestly I've struggled with this in the past (and has been the downfall of otherwise amazing relationships) Thank you for sharing your wisdom with us! This is definitely something I use when I disagree with my husband. We understand that we won't always see eye to eye and that is ok.
Forgetting to practice grace...this one's HUGE. We get caught up in our "right-ness" that we forget to just be KIND and it's bad. 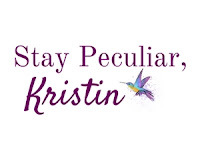 SUCH a good post, Kristin! While I HATE being wrong, and struggle with some know-it-all tendencies, I find as I get older that I recognize I understand less and less, and look for measured conversation with others. understanding, or at least trying to understand other viewpoints, is what creates peace and opens your mind to more.